Lowering Springs – Its what it says on the tin..or so you might think. 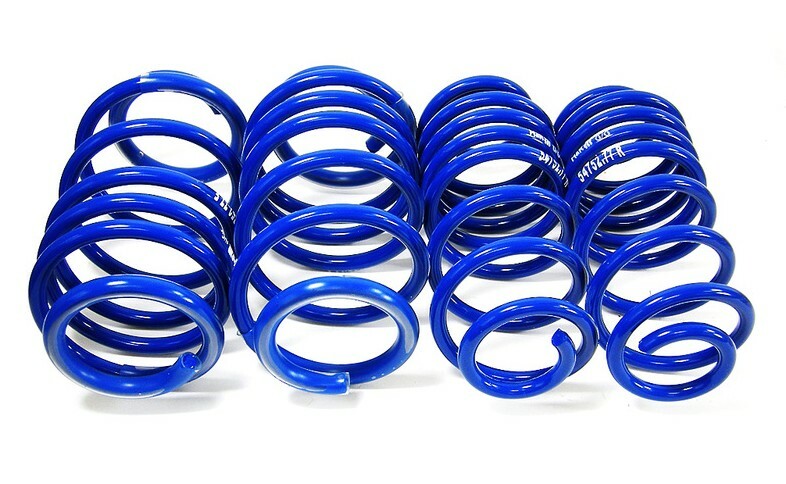 Always go for a quality set of springs as many of the cheaper options have different spring lengths and settings. And if your not sure then just send us an email of call us and well be more than happy to point you in the right direction. Lowering your vehicle with a set of lowering springs lowers the center of gravity and increases the camber giving weight to the steering and less roll when cornering. This is all said with moderation in mind…going too low can have negative effects on tire wear, handling and ride comfort.. Lowering springs have been designed to lower your car between 25-35 mm in most applications…some a little more and some a little less. Lowering spring spring kits allow you to get the car low and still retain a certain level of driver comfort as there should always be sufficient suspension travel to allow the dampers to do there job….all too often going too low uses up the damper travel and we have seen vehicles with less than 1cm of travel ! Aesthetic improvements the look of the vehicle..often ride heights look far too high. Once again always feel free to contact us here at Turbopacs when it comes to purchasing a set of lowering springs…we have the experience to guide you through this mine field..